No-one has done more for women’s golf in Australia than Karrie Webb in recent years. 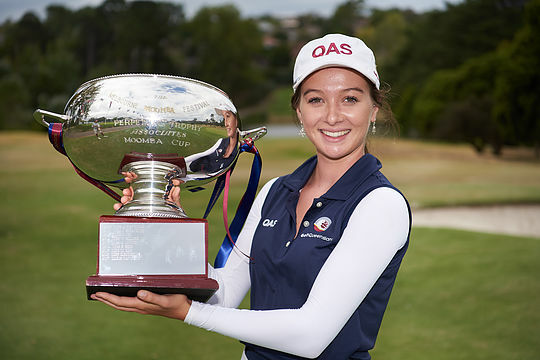 The popular Queenslander has now given scholarships to a couple of amateurs every year for the past decade and added to that this week when she named two more to travel to the US and learn more than they could ever have hoped for about the women’s professional game and what’s in store for them. It’s an experience money can’t buy and Sydney’s Grace Kim and Gold Coast golfer Becky Kay were over the moon when they were selected for the 2018 Karrie Webb scholarships. One of the highlights of that trip is spending time with Webb at the KMPG Women’s PGA Championship – one of the women’s five majors played each year. The two amateurs receive scholarships to the value of $10,000 to be spent on international travel and playing experiences over the northern summer with mentoring support from Webb during the year. Kim receives the scholarship for the first time, while Kay experienced it last year when she travelled alongside fellow Queenslander Karis Davidson. Among the criteria considered in the determination of the scholarships are performances in the Karrie Webb Series, community work supported by the individual’s performance as an ambassador for golf in Australia and overseas, and demeanour both on and off the golf course. In addition to their impeccable behaviour, their standing within the golf community and as role models for other young golfers, Kim (17) and Kay (19), performed well in the Karrie Webb Series which ended with the West Australian Stroke Play Championship last week. Kay, a member at Coolangatta Tweed Heads, won four events through the 2017-18 season, including three in a row to end the series in Perth last week. But Kim, the reigning Australian Junior champion and Avondale member, was more consistent throughout, finishing no lower than third in all six of her counting events while winning two.